Noah Shuck, Eveleth-Gilbert. The junior goaltender faced 41 shots against Virginia/Mountain Iron-Buhl, and he allowed just one goal — a second-period power-play conversion — in the Golden Bears' 3-1 win on Dec. 15. Tommy Walsh, Minneapolis. The senior goaltender posted a .955 save percentage in a 2-2 tie against Thief River Falls on Dec. 15. His 42 saves — more than double the amount of the opposing goaltender — helped shut down the Prowlers' offense for the game's final 30 minutes. Josh Dykhoff, Wadena-Deer Creek. The freshman goaltender faced the most shots in a game he's seen in his young career, as he made 48 saves in a 3-3 tie against Northern Lakes on Dec. 11. Dykhoff stood tall in the final 30 minutes — holding the Lightning scoreless and allowing the Wolverines to come back from a two-goal deficit. Caden Espinda Banick, Eastview. The junior defenseman led the Lightning's 3-2 overtime comeback win over Bloomington Jefferson with the team's first goal, a power-play conversion with less than five minutes to play in the third period. Banick assisted on a second power-play goal less than two minutes later to send the game to overtime, where he assisted on the game-winner 11 seconds in. Matthew Gleason, Cretin-Derham Hall. There was no shortage of goals in the Raiders' first meeting with Forest Lake, which ended in an 11-9 Cretin-Derham Hall win. Gleason, a junior forward and Colorado College commit, produced six points in the victory, as he recorded a hat trick within the game's first 20 minutes and added three assists — one on a power play — to lead the Raiders to a Suburban East Conference win. Jagger Johnson, Waseca. 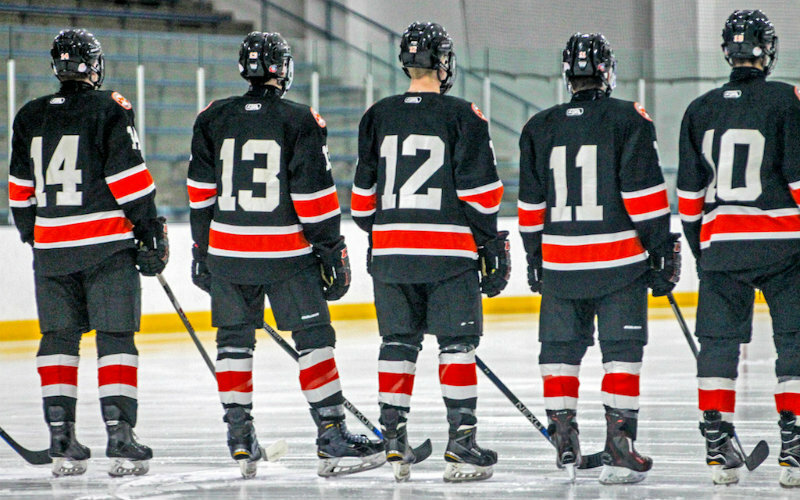 The junior forward recorded a hat trick in the second period of a 6-2 win over Worthington on Dec. 11, and he added another goal and an assist in the third period. Johnson scored both of the Bluejays' power-play goals. Garrett Pinoniemi, Holy Family Catholic. Pinoniemi had a hand in all of the Fire's goals in a 7-2 win over Greenway on Dec. 14 — scoring three goals and assisting on the other four. The junior forward, a University of Minnesota commit, is tied for tenth in the state with 19 points through the Fire's first seven games. Noah Roitman, Simley. The senior defenseman filled a vital playmaker role in the Spartans' 6-2 victory over Austin on Dec. 15, as he assisted on five goals — including three on powerplays — to lead the team's offense. Dalton Saltness, Forest Lake. The senior forward made an early impact for the Rangers when he scored on the team's first power-play opportunity against Woodbury on Dec. 15. He added a short-handed assist midway through the first period, then dished two more assists and scored the Rangers' final goal to round out the 5-2 conference win. Tucker Skime, Thief River Falls. Skime led the Prowlers' 3-2 come-from-behind win over Bemidji on Dec. 11, as he scored two goals and added an assist. The junior forward cut the Lumberjacks' lead in half with a goal early in the second period before adding an assist and a goal 21 seconds apart late in the third period. *Stats and records as of Dec. 16.